This recipe for sautéed wild mushrooms can be prepared in about 15 minutes and is a perfect topper for pasta, rice, millet or quinoa. You can also enhance roast chicken; seared tofu or tempeh; or a nice piece of broiled or seared fish (sea bass, wild salmon or halibut are personal favorites). 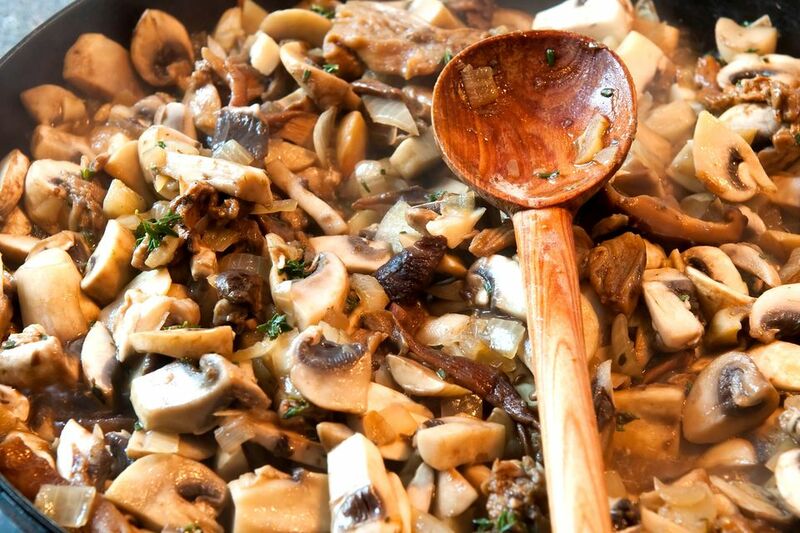 Mushrooms are browned in olive oil with garlic, shallot and your choice of fresh herbs; a bit of wine finishes the dish. As simple as the recipe is, the finished product is rich, meaty, earthy and absolutely packed with nutrients. Wild mushrooms have long been revered in the East and West alike for their purported potent medicinal value. Trim and discard any tough stems. (Shiitake stems are great for stocks, but are too tough to eat. The very bottom of mushroom clusters like hen of the woods may have a slightly woody layer, so trim it away). Slice the mushrooms 1/8 of an inch to 1/4-inch thick. Warm the olive oil over medium-high heat in a large skillet. Add the shallots, cook 1 minute, and add the mushrooms. Cook, stirring frequently, for 8 to 10 minutes, until the mushrooms have released their juices and begin to brown. Stir in the garlic and white wine, increase the heat to high, and cook about 2 more minutes, until the wine has evaporated. Toss in the herbs; stir well and season to taste. Stir in the parsley and serve. Many edible culinary wild mushrooms have documented healing value in the holistic nutritional community. Please be advised that the following statements are not approved by the FDA, and should not be construed as a substitute for medical advice. Shiitake: This mushroom has been used for holistic cancer and AIDS treatments, immune regulation, and liver protection. Porcini: This mushroom is considered a cardiovascular and metabolic tonic and is generally strengthening for systemic weakness. Hen of the Woods (Maitake): This mushroom is considered one of the kings of medicinal fungi. It is believed to possess anti-cancer properties, act as a tumor inhibitor, and protect the liver. Oyster: It's used to strengthen veins, as an immune enhancer and to relax tendons and joints. Chanterelle/Black Trumpet: Ppacked with B vitamins, this immune enhancing mushroom purportedly inhibits tumor growth. Portobello: This potassium-rich mushroom helps muscles and nerves. Crimini: These brown button mushrooms are rich in antioxidants and aid in cancer prevention and liver detoxification. Morel: This mushroom is anti-inflammatory, rich in antioxidants, is believed to contain anti-tumor properties and is immune enhancing.